While the Russians were being driven out of East Prussia, a German Army, commanded by General Gallwitz, had invaded Russia and aimed a sudden blow at Przasnysz, a town lying some 50 miles north of Warsaw. If this position could be taken, the Germans would have no difficulty in cutting the railway between Warsaw and Petrograd. On February 24, 1915, the Germans stormed the town, which was garrisoned by a force of 40,000 infantry, with some cavalry in support. Przasnysz was evacuated the next day, the Russians making an orderly retreat and contesting every foot of the ground. One Russian division held a ridge southwest of the town for 36 hours against the attacks of four German divisions. Apprised of the danger, Grand Duke Nicholas dispatched a body of Russian raw recruits to the scene. Lacking rifles, and armed only with bayonets and hand grenades, these raw recruits heroically charged the German columns. A desperate hand-to-hand combat followed. In the end, the Russians triumphed. The seasoned German troops fled in headlong retreat before those raw recruits, never stopping until after they had reached the German border. The Russians claimed 11,000 prisoners in this engagement. General Gallwitz, having meanwhile strengthened his army, on March 8th advanced again in the direction of Przasnysz, but only to be repulsed. For ten days, from March 13, 1915 to March 23, 1915, a determined battle raged round about Jednovozez, no fewer than 46 assaults taking place. The casualties on both sides were heavy, but in the end the Germans were driven back. been deposed from his command and three new Russian corps, 150,000 strong, had been brought to the defense of Fort Grodno. The ranks of Sievers' decimated corps had also been filled up. Thus reinforced, the Russians gave battle again to Hindenberg's army, which had now reached Suwalki and was endeavoring to cut the main line from Warsaw to Petrograd. This movement was held in check. Hindenberg now began the bombardment of Ossowietz, but here the massive defenses proved unconquerable by the 42-centimeter mortars which had reduced the forts at Liege and Namur. The bombardment continued through February and March. Finally, on April ll, 1915, the Germans gave up in despair all thoughts of forcing the Russian line in the Warsaw salient and retreated to their frontier. The Russians sent a small body of troops into Courland on March 18th and drove the Germans out of Memel, but were themselves forced to evacuate the city a few days later. 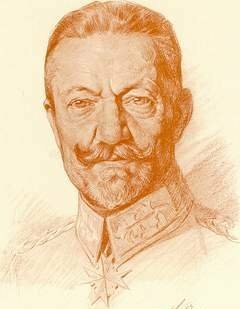 On April 27, 1915, a large German Army, under command of General von Lauenstein, entered Courland. Preceded by a cavalry brigade, which destroyed all the railway tracks and bridges to the southwest and northwest of Shavli, the Army advanced in three columns. One column moved on Libau, held by the Russians, which was shelled by German naval vessels on April 29, 1915. The city was evacuated on May 8, 1915, and at once occupied by the Germans. RUSSIANS ATTACK ON ENTIRE FRONT; Forces of German Raw Recruits, Short of Officers, Reported Shattered in Poland. LARGE NUMBERS CAPTURED Roads Blocked by Hundreds of Disabled Motor Trucks and Vast Supplies Seized. Przasnysz [ˈpʂasnɨʂ] is a town in Poland. 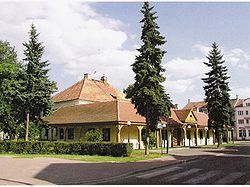 Located in the Masovian Voivodship, about 110 km north of Warsaw and about 115 km south of Olsztyn, it's the capital of Przasnysz County. It has 18,093 inhabitants (2004). One of the most important towns in Mazovia during Middle Ages. City laws - 1427.